Fresh small mackerel are perfect for making fish curry as they stay firm through the cooking process. For the most part, we bought fish from the designated large fish markets that were anything but modern. Fishmongers they were in complete truth - from their gill and blood stained clothes, to the unscrubbable fish odor hanging off them to their very cant of language. Everything that you may have ever read about the fishing class is true and evident in these markets. Added to that, there would be rivulets of fish spiced cleaning water running through the open gutters. Needless, to say, I hated going there on the few times I accompanied my granddad as a child. Yet, there was a thrill that I would stubbornly not acknowledge resorting to turning up my nose at the filth! First, my granddad loved, nay, thrived in markets. And, I loved him more than anyone I ever did. As the original food lover of the family, he relished hand picking the best produce, haggling, and simply chatting with the vendors, while I either hopped from one foot to another or looked at the very very very fresh fish all around me. Not once ever then, did I think, I would come to cherish those memories. 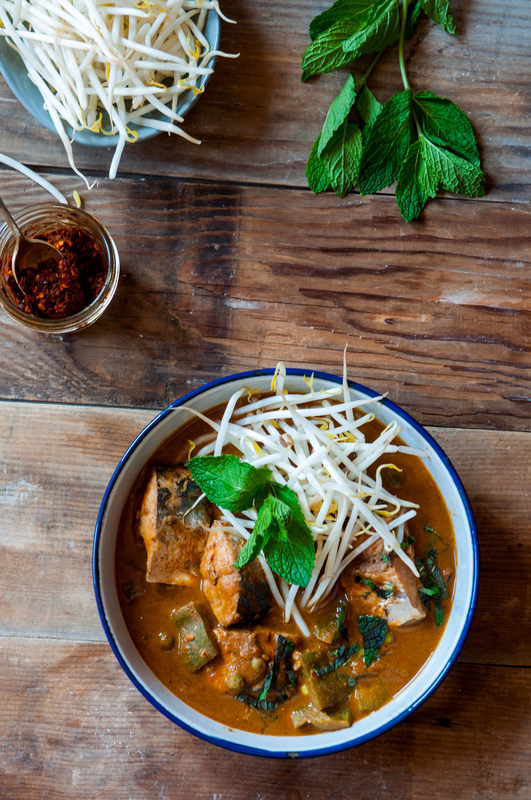 Street style Asian fish curry made with freshly roasted whole spices and dabs of almond butter. He has passed since and that may be one reason to hang on to those moments. But, there is also a very pragmatic reason for this nostalgia. Never since I left Asia, a few years later, was I again in proximity to such abundance, variety, freshness and quality of seafood. I saw fish in the market that was kept alive until the moment of purchase, see it wiggling about in a water basin. Some could not be killed even after purchase but needed to kept alive just until being cooked. But, I took them all for granted and simply bemoaned the soiling of my shoes and the sticky odor that is of the sea. Ah! Had I know then?! Well, I suspect, I still would have that petulant teenager! This is a straight up, honest blue collar fish curry cooked with spices that leave you with no doubt of having eaten, full and satisfied. It brings back the memories of fish markets, screaming fishmongers, roadside food havens and the earthiness of a day's labor. Which, is why, I have always found fish curries to be earthy and grounding. In any country, meat and chicken are for those who can buy it, rear it or hunt it. But, fish? Well, anyone with a rod, a piece of string and proximity to a waterbody can get to it. And, the thing about curries is that because they are so loaded with flavor, literally any type of fish can be used. Like the brilliance of using cheeper cuts of meats in slow cooked dishes, the ignominy of an unknown, lackluster flavored fish can be enamored with a trifling of spices. Late at night, when most of the city has finished their dinner, a secondary city seems to come alive - in the homes of the domestics, the road side shops serving laborers and late night office workers. Yes, these are not of the genteel middle classes but of the lower orders but there is an honesty about this life that is very fascinating. When the sun is well below the horizon and the street lamps are lit, several shops come to life, by railway tracts, bus stations, alleys near bigger restaurants - anywhere where the blue collar class can stumble upon them on their way home. No, these are not the nefarious ones that sell backyard arrack and questionable tobacco. These are the ones that are flamboyant in their aromas, assaulting the senses with blatancy and one that leaves you with a heady attraction. The food here is bold, pungent and redolent with warmth of home-like cooking. The curry is reminiscent of the several variations of fish curry you will find on the streets in Asia. Mine here is a confluence of South Asian and East Asian flavors with the curry spiced with roasted whole spices, lemongrass and topped with the crunch of bean sprouts and mint. Although, usually served with rice in most cultures, in South India, it is also eaten with rice and bean pancakes. So, I served it thus, with sprouted mung bean and rice yeasted pancakes. For me, the fish curries from these little tucked away vendors is perhaps the most memorable of all, combined with the sticky flavors of fish with the pungent curries they are cooked in. As much as you may think, they are probably unhealthy, they are least likely to be (as long the water used is good). Because, the food is always prepared fresh and consumed the same day, since they lack the storage facilities of refrigeration. Yet, the thing that makes it all worth it for me, is that in each bite you can taste that parallel economy, one that most of us, during the day, do not notice or give a second thought. But in that bowl, you can taste, the sweat, hopes, struggles and life of the working class! If you are in tropical Asia, India, Philippines, Thailand, HK, Singapore, anywhere, help yourself to fish curry by the sea, on the streets. It is an experience not to missed, and one, I assure you, will be treasured if you love food or culture! Although this curry begins with a spice combination akin to South Indian curries, I layer it more influences from East Asian such as lemongrass, bamboo shoots and the use of fresh vegetables. Indian meat curries rarely have any vegetables in them and if so, only potatoes for bulk. So, here using the Thai inspiration of piling on vegetables, I used green pepper or capsicum, fresh corn and peas. You can really use whatever you have. Toss the filets in salt and set aside. In a heavy bottom pan, toast the whole spices on low heat for a few minutes until their fragrance is released. Add to a blender. Add the onion, tomatoes, garlic, chili paste, mint and lemongrass to the blender and pulse to create a smooth puree. Reduce to the lowest heat setting, add in the almond butter, stir, cover and let simmer for 45 minutes until the rawness goes away and oil starts separating. Give it a stir and it should be thick like freshly ground nut butter. Gently add in the stock and almond milk and bring to a boil. Let it simmer for another 15 minutes. Turn off the heat, to avoid splatter and arrange the fish pieces around the pan. Turn the heat back on to low and cook for 5 minutes. Add the vegetables and cook for another 5-10 minutes. Leave the curry to sit for atleast an hour before serving to allow the flavors to soak into the fish. Overnight is even better. Since the fish is cooked for only 10 minutes, this resting time will also ensure it is full cooked. Serve over rice or pancakes topped with shoots and sprinkled with fresh mint. I collect scraps and ends of vegetables to make typical stock. For this one I used the same pressure cooked it with the fish heads and tails to make a quick version. If you don't have a pressure cooker, you can do the same with a regular pot. Simply keep it at a boil for 15 minutes before straining. Add a little oil to the pressure cooker and fry the fish heads and tails. Pile the rest of the scraps and spices. Cover with water and pressure cook to 3 whistles. Let it cool as the pressure eases and then strain out the stock for use. Street Food Argentina - Pan de Leche from Cristina!! !